Can I take statin medicines? Statins are available only by prescription. You can take them if your doctor gives you a prescription. That’s between you and your doctor. Unlike some sites on the internet, this website is not anti-statin and we do not indulge in conspiracy theories about the medical establishment and pharmaceutical companies pushing these drugs on people. There are good things about statins and bad things, and we try to present the evidence without bias. 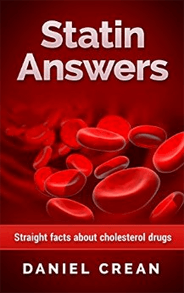 Many people have cholesterol profiles that can be affected by statins. For those with a history of cardiovascular events or with high risk for heart disease, statin use has been found in repeated large studies to lower risk. They unquestionably work. They also have side effects. For the large majority of patients the side effects are minor in the short term. For some, they are serious. Whether statins should be prescribed widely to people with no history of problems or few risk factors – that is a subject of on-going debate. How will I know if I am one of the people with side effects? Upon starting, you will be given a blood test. About a month after starting the regimen, you will have another blood test to measure changes in markers that indicate liver problems. That will pick up the most dangerous side effects. If you notice other adverse secondary effects such as muscle weakness or memory loss, these could be due to the statin. Consult your doctor if you notice these effects. If I start taking the statin, will I have to continue for the rest of my life? The going presumption is that you probably will do so. However, you can discuss with your doctor the possibility of a “drug holiday” break from the medicine after a while. Further, if there is a significant change in your overall health (e.g. you lose a lot of weight), you can ask your doctor about stopping the statin regimen. You can always go back. Is my doctor trying to foist these drugs on me because he’s getting a kickback from the drug company or because he’s been brainwashed into thinking everyone should take statins? We’re not cynical enough to believe that. Pharmaceutical sales representatives are known for pushing prescriptions of their products and there have been allegations of a distorting influence on the medical practice. But the days of the worst abuse seem past. In any case, those hard sales tactics were used for new drugs that are still covered under patent, and the two most popular statins are now available as generics, so the profit motive has declined. Further, although we do not put doctors on pedestals, we do believe they for the most part have their patients’ best interests at heart. Like members of any profession, physicians are subject to influence from their peers, and the fact that statins are so widely probably makes doctors more likely to prescribe them. But doctors are also aware of the risks and concerns about statin usage, and weigh the costs and benefits with regard to each patient. And doctors typically have dozens of patients on statins, so they have experience that the patient does not. Which of the statin drugs will I take? There are 7 statin medicines available in the US and probably about the same number in the UK, Canada, and elsewhere. But three are mostly used. The brand names are Lipitor, Zocor, and Crestor. Your doctor will probably prescribed one of those. Lipitor and Zocor are available as generics (under their generic names atorvastatin and simvastatin), so most likely you will get one of the generics (for cost reasons). These SHOULD be called by their generic names atorvastatin and simvastatin, but many doctors and nurses will call them generic Lipitor and generic Zocor. The generic name for the medicine in Crestor is rosuvastatin, but it is not available as a generic. Is one of the statins better than the others? For all practical purposes, any of the leading three are about the same. They work the same way, have the same side effects. Each person is different, so your body may respond slightly differently to each. If your cholesterol level doesn’t change, the doctor may change the drug you are taking. More likely, he will increase the dosage of the drug you are already on. Feel free to ask your doctor about the possibility of changing statins, or even the possibility of pursuing other ways of reducing your cholesterol. Or of forgoing medicine altogether. The cost to you depends on your insurance plan. The most popular statins are now available as generics, so even if you have to pay out of your pocket, the cost should not exceed $60 per month. Safer than most drugs. All medicines pose risk, and statins cause side effects in some patients. Occasionally these effects are bad enough that the patient has to stop taking them. In rare cases, the effects do serious damage to the patient’s bodies. But many large studies of thousands of patients, as well as real-world experience of tens of thousands of doctors around the world and millions of patients, have shown statins to be generally safe. Is there another type of drug I can take instead of a statin? Yes. Medicine has other approaches to cholesterol reduction. Are new statins being developed? Yes, pitavastatin was introduced in the US by the Japanese company Kowa and marketed by US-based Eli Lilly. Pharmaceutical companies are attempting to develop new therapies for the cardiovascular system. Some of the compounds under investigation are statins; some are not. I heard I wasn’t supposed to eat grapefruit when I am taking a statin. Grapefruits have a chemical that can interfere with the body’s breakdown of some statin medicines. Too much of that chemical will result in an increase in the levels of statins in your body and increase the risk for side effects. The website for the Cleveland Clinic points out that grapefruit problems have been shown only with the statins lovastatin and simvastatin and quotes a cardiologist as saying patients without a history of statin side effects should be able to eat moderate quantities of grapefruit.